“Research of 2,000 workers from Skype and YouGov earlier this year found that 70% of people want to work from home more often however, over half ( 51%) worked for companies where this was not allowed. The nature of today’s corporate environment is affecting the way many enterprises handle their business processes. With the economy becoming more and more competitive, companies are being faced with new challenges. 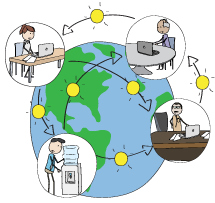 The need to take business globalization, customer service, and project management to another level is essential. For some companies, this may mean offering their workers more flexible working options (such as Telecommuting), in order to maximize productivity. For others, it may mean outsourcing work to find more skilled laborers at a lower cost. That being said, executives and team leaders realize that in order to outperform their competitors, they must strengthen their business processes while managing dispersed team members, and at the same time, delivering winning products or services. Luckily, the rapid changes in technological developments make this easier. New cloud-based technologies allow dispersed team members to easily access files, emails, and project information from anywhere. With these, some companies choose to let their employees bring their own devices to work and have access to their work whenever they need. 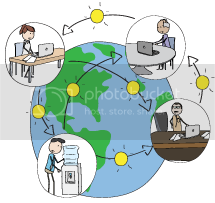 Dispersed team members also include customers; without customers, most businesses would not be where they are today. With the help of Web 2.0 tools, companies can now easily communicate with their customers and bring them into their product development process, no matter where they are. One challenge that businesses face when working with remote workers, such as external business partners, is to tighten collaboration. The closer external team members feel to the company, the more productive they will be. New cloud-based collaboration platforms, especially the ones that feature social collaboration features allow for “virtual team creation,” and are the ideal solution to bridging communication gaps. With these, companies can stay updated on what all team members are working on, in real time. Some tools even allow team members track how much work has been done on specific tasks, and predict when they will be done. Teams who want to improve efficiently immediate communication, clarification, and on-the-spot problem solving are encouraged to use the many Web 2.0 platforms available today. Do you work with remote team members? If so, how do you manage them and ensure everything goes smoothly.